ApplicationWindow is a Window which makes it convenient to add a header and footer item to the window. ApplicationWindow supports popups via its overlay property, which ensures that popups are displayed above other content and that the background is dimmed when a modal popup is visible. See also Page and Container Controls. Note: Assigning a ToolBar or TabBar as a window footer sets the respective ToolBar::position or TabBar::position property automatically to Footer. 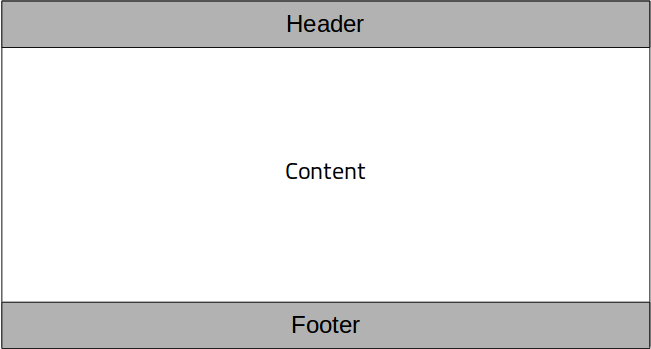 See also header and Page::footer. This property holds the window header item. The header item is positioned to the top, and resized to the width of the window. The default value is null. Note: Assigning a ToolBar or TabBar as a window header sets the respective ToolBar::position or TabBar::position property automatically to Header. See also footer and Page::header. This property holds the window overlay item. Popups are automatically reparented to the overlay. overlay.modal This property holds a component to use as a visual item that implements background dimming for modal popups. It is created for and stacked below visible modal popups. overlay.modeless This property holds a component to use as a visual item that implements background dimming for modeless popups. It is created for and stacked below visible dimming popups. See also Popup::modal and Popup::dim. This attached property holds the control that currently has active focus, or null if there is no control with active focus. The property can be attached to any item. The value is null if the item is not in an ApplicationWindow, or the window has no active focus. This attached property holds the window overlay item. The property can be attached to any item. The value is null if the item is not in an ApplicationWindow.